This program has been replaced with Looping Audio Converter. 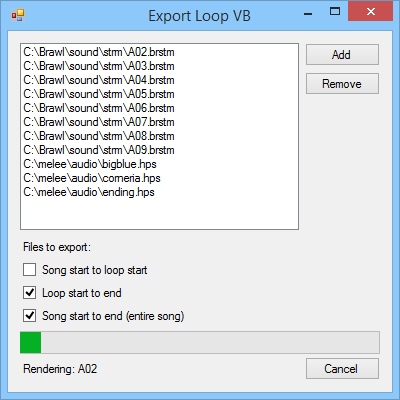 Export Loop VB is a frontend to exportloop.exe, a C application that uses vgmstream to convert compatible video game music formats into WAV files. Supported formats include BRSTM, HPS, Ogg Vorbis, and many others. To add files, use the Add button or drag-and-drop them into the list. From the song start to the loop start – the WAV filename will end with the string "(beginning)"
From the loop start to the end – the WAV filename will end with the string "(loop)"
The output directory defaults to the current folder, but you can change it using the Browser button. You can also open the folder in File Explorer with the Open button. Export Loop VB is written in Visual Basic and is a separate application that calls exportloop.exe in the background. exportloop.exe can be used on its own as well. exportloop.exe is compiled with MinGW and links to MSVCRT.dll.